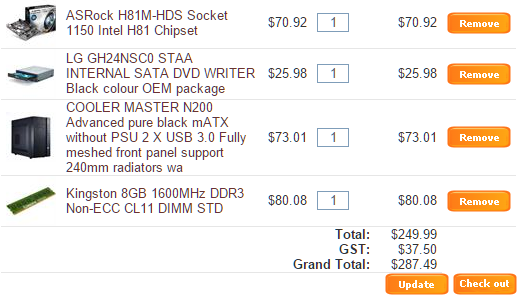 PC Build Is this any good? Forums › Desktop computing › PC Build Is this any good? New here. Im looking at getting someone to build me a entry levelish Gaming rig. Id appreciate it if anyone could look at the list and tell me what might need changing or whats good? Thanks guys appreciate it! Motherboard - ASRock AMD FM2+ FM2A68M-HD+ for APU with 1 FM2/FM2+ Socket, mATX, 2 X DIMM DDR3, USB 3.0 (front and back) , SATA3, VGA/DVI/HDMI. CPU - AMD A10-7700K 4-Core, 3.4Ghz/3.8Ghz (turbo core), 4MB 1 Cache Socket FM2+ 95W BE Integrated Radeon R7 Series ( FM2+ socket motherboard only). Hardrive - WD 500GB 3.5" Blue Edition SATA3 7200RPM 16MB Cache 1 HDD Solid performance and reliability for everyday computing. CD/DVD Writer - LG GH24NSC0 SATA Internal SATA DVD WRITER Black 1 colour. RAM - Crucial 8GB DESKTOP DDR3 1600Mhz DIMM 240pin Non 1 ECC PC3-12800 Desktop RAM. VGA - Asus GTX 750 Overclocked 2GB GDDR5 PCI-E3.0 VGA 1 DVI HDMI. PSU - ZALMAN ZM600-GV 600W ATX PSU with MEPS Ready - 1 NZ Version. If you want new and to last, I'd suggest dropping the FM2+ board and the APU and go for a FX6600 CPU with an AM3+ board instead - although I would instead recommend taking a look for something (literally anything) Core branded for socket 1150, and get a socket 1150 board. Core i3 is dual core that uses hyperthreading to appear as quad core (2 bigs working as 4) whereas the AMD is a quad core that works as only a quad core. Basically, in 4 core jobs the AMD has an edge, in video games, and single threaded heavy tasks (basically brute strength) the intel will be faster. Also, I'd suggest seriously looking for a second hand graphics card instead of a new one (if this is for video games), as you'll get a much faster one for a similar cost. If you don't plan on gaming, that build is fine, just don't buy the 750 ti. Also, consider asking the folks on Price Spy for more details, and tell us/them what you're gonna be using it for. Throw in ssd instead. You lose a bit of capacity and gain performance. I think even if it's only a low capacity drive (64-128GB) you should throw an SSD in there. They can be had on Amazon nowadays for less than $100, and the speed gained from them is well worth the price. Who is he? Where are you buying this all from? You might want to shop around and check out PriceSpy to see how much you can get this stuff for, and put it together yourself at home - it's pretty much Tab A into Slot B. Are the peripherals included in the quoted price? I have a socket 1155 motherboard that suits an Intel i5/i7 2xxx and perhaps a 3xxx CPU in perfect working condition here. I put it up in for sale a while back but didn't really bother to follow through, wasn't worth my bother for what was offered. SSD is really nice to have. 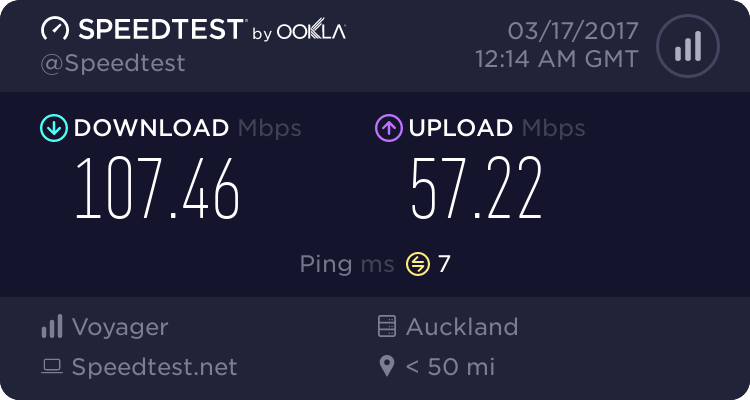 If you get a spinning disk don't bother with 500GB, 1TB is cheap and so is 2TB. 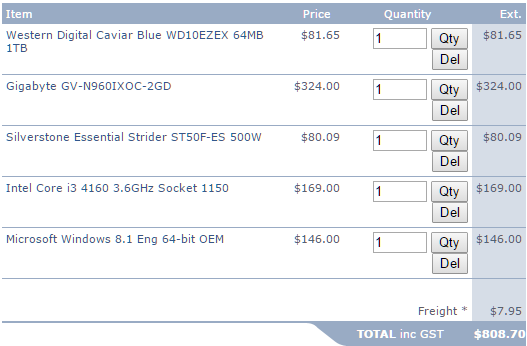 Anyway, these are the components I'd choose at the price point. Compared to the original build, there's a faster processor - in almost every task going off benchmarks and especially gaming, a 1TB HDD and much faster graphics card. The PSU is lower wattage but the build shouldn't consume more than 250W under load.